Construction on the 15-mile stretch of the Seward Highway from the bottom of Turnagain Pass to the Girdwood intersection is in full swing for the second year. The project, estimated to cost between $200 million and $250 million, will replace or repair nine of the bridges that span the many creeks, overflows and rivers along Turnagain Arm, including four that will be under construction this year, according to the Alaska Department of Transportation and Public Facilities. The work is expected to conclude in 2020. This year’s work along the project corridor will be completed by Granite Construction under a $51 million contract, said Shannon McCarthy, a spokeswoman for the transportation department. Additionally, crews will be realigning the highway along curves that see a high number of accidents, constructing new parking lots and improving access to existing ones, among other changes. Two miles of highway between Mile 84 and 86 will be closed from 9 p.m. to 3 a.m. through Thursday morning while crews install cross culverts. The nightly road closures will continue April 22-23 in the same time frame. Additional work is already underway along other portions of the Seward Highway, as well as highways throughout Southcentral Alaska. A $75 million project to straighten and widen the highway at Windy Corner, near Indian, has been in the works for years and could start in 2020 at the earliest. Elsewhere, the DOT is also continuing to identify and make emergency repairs to areas of road that were damaged in the Nov. 30 earthquake. “The thawing road beds are starting to unmask some of the damage that was being held together by frozen asphalt and soils,” McCarthy said in an email. Most of these projects will require lane restrictions, reduced speed limits and detours, McCarthy said. This rockfall-prone stretch of highway along Windy Corner and Beluga Point became particularly dangerous after the Nov. 30 earthquake when large rocks began falling onto the road. Crews pushed the rocks into a ditch immediately after the earthquake and will be working this season to remove them entirely. Drivers should expect lane closures and flaggers on the road. Construction will begin in September on the stretch of highway that runs along the eastern side of Kenai Lake. 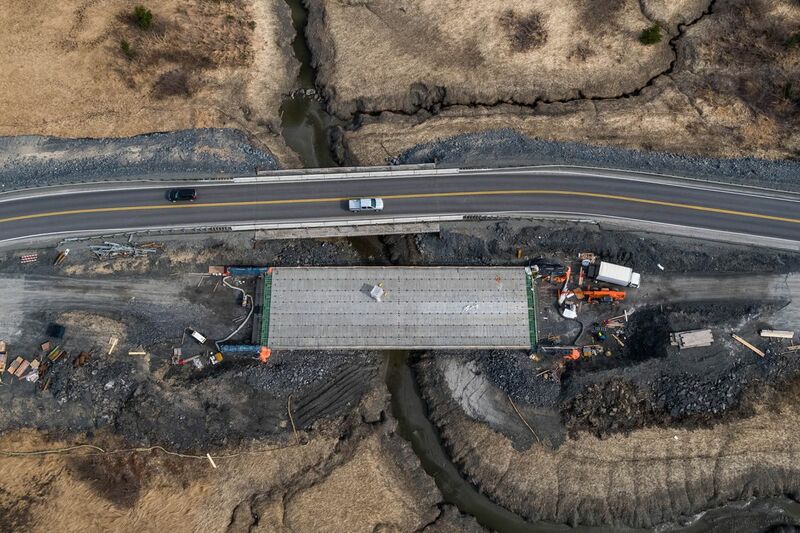 Crews will be widening the highway, adding at least two slow-vehicle turnouts, replacing the bridge at Victor Creek and repairing two other bridges. Most of the work will take place in 2020. Most of the work on this project near Eagle River will start in the fall, but it will involve a number of changes transportation officials hope will improve the highway’s capacity. By the end of the project, the highway will have an additional southbound lane -- which could allow for a “high-occupancy vehicle” lane in the future -- a new southbound bridge over Eagle River to accommodate the new lane, and a new frontage road west of the highway. Additionally, crews will be realigning the highway to reduce its southbound grade south of Eagle River Bridge. This 5-mile stretch of the Glenn Highway in Palmer will go from a two-lane road to a four-lane divided highway. Crews are replacing culverts along the highway this summer, and that may affect traffic in the area, the DOT said. The Sterling Highway has been closed at Mile 106 since March 5 while crews replace a culvert at Coal Creek. It will remain closed until April 22. The DOT is asking drivers to use Kalifornsky Beach Road as a detour. The closing is part of an ongoing project to widen the shoulders and install rumble strips along the highway between Soldotna and Clam Gulch.